Notes | Written and compiled by a veteran United Press International photographer and editor, PICTURE THIS! tells the stories behind the stories--and how some of the most iconic and revealing news pictures of the late 20th century came to be. There are powerful photographs of the Civil Rights struggles, the Vietnam War, and great moments in sports, entertainment, and politics. PICTURE THIS! follows the development of the wire picture services, the storied competition between smaller but scrappier UPI and its far larger competitor, Associated Press, and how UPI's 11.5 million-picture library ended up in a Pennsylvania cave, owned by Bill Gates's Corbis. Gary Haynes spent 11 years on the world's news fronts as a UPI photographer and manager. He lives in Oregon, Illinois. Comments | [01/02/07] This book was so enjoyable I was a little bitter when I finished it last night. Gary Haynes did such a wonderful job telling the story of UPI and the many characters who worked there during the heyday and the end. This book combines wonderful photographs with some great inside anecdotes about the scrappy UPI photo department and how they fought so hard for many years to compete with the much larger AP. This book was truly a labor of love for Haynes and it really shows when you hold it in your hands and devour the words and pictures. Highly recommended. 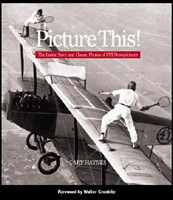 Comments | [08/18/06] Gary Haynes showed me the galleys for this book a couple of months ago, and it is an outstanding photo book with great and sometimes historic pictures along with surprisingly well researched captions and anecdotes mostly by Haynes. If you're a Boston sports fan, the picture of Red Auerbach and Bill Russell celebrating one of their championships amongst the fans on the Boston Garden court is alone worth buying the book.